Goof. 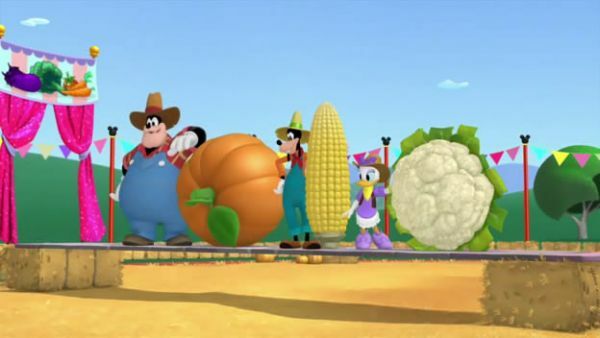 Because now, make way for the big veggie and fruit contest! MINNIE: Oh dear. Oh dear, oh dear! MICKEY MOUSE: What's wrong, Minnie? 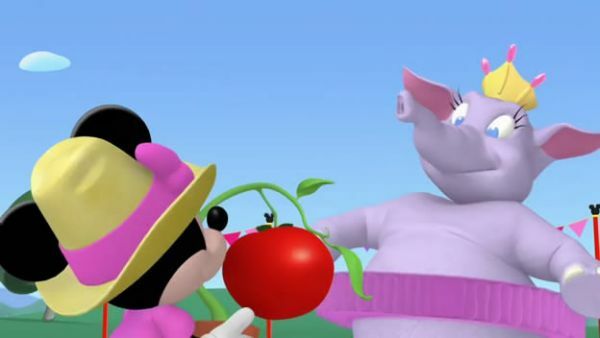 MINNIE: My prize tomato needs water. But every time I fill my sprinkling can, the water leaks out. What am I going to do? MICKEY MOUSE: Aw. Don't worry. The clickety-clack tractor has plenty of water. Wuh-oh! It's all out of water! Gee, maybe there's a mouseketool that can help us. Everybody say ALL: Oh, Toodles! TOODLES: Head-head-heads up, partners! MICKEY MOUSE: All that's left is the mystery mouseketool. Everybody say, "mystery mouseketool!" ALL: Mystery mouseketool! MICKEY MOUSE: What's today's mystery mouseketool? DAISY: Ooh! 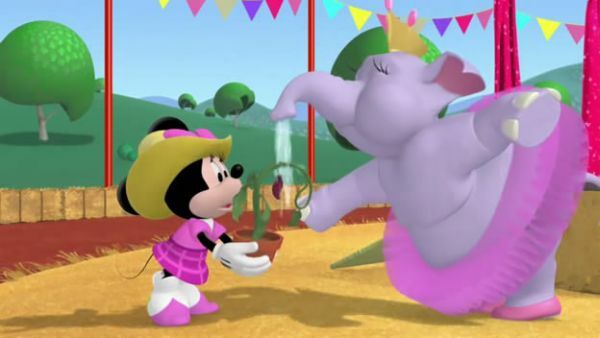 It's bubbles the elephant! 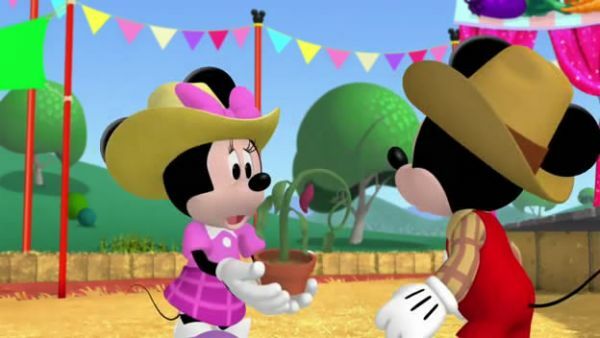 MICKEY MOUSE: We picked all our mouseketools! Say "super cheers!" MINNIE: Bubbles, over here. Thank you, bubbles! You saved my prize tomato. CLARABELLE: Stupendous! 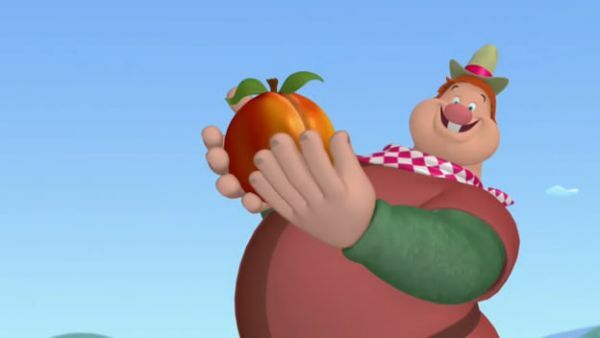 Now, let's start the big veggie and fruit contest! DAISY: Say hello to my kooky cauliflower! GOOFY: I've been growing old corny here ever since he was a baby corn! PETE: Check out my pumpkin, Petey fans! Whoa. Hey! What's going on? Wow-za! It's Willie the Giant! WILLIE THE GIANT: Duh. Howdy, little, itty-bitty buddies. GOOFY: Gosh! That sure is a peach of a peach you got there. WILLIE THE GIANT: Yeah! And it's big, too! Just like me! Oopsie! Oh, beans! DONALD DUCK: Help! MINNIE: Oh, my! We've got to help Donald!